183% Trending now. Earn exclusive cashback on completed bookings to everything from cosy B&Bs to Thai beach huts with LateRooms.com. Sign up for free and just shop with LateRooms.com as normal. Our members earned £20,000+ at LateRooms.com in the past month. Cashback is exempt on Apex Hotel bookings. Cashback is only available on hotel bookings. Cashback will not be paid on gift card purchases or ancillary products such as cottages, theatre and car hire. LateRooms.com cashback can be earned simply by clicking through to the merchant and shopping as normal. LateRooms.com Cashback is available through TopCashback on genuine, tracked transactions completed immediately and wholly online. Please note any Missing Cashback Claims will not be submitted until the stay has been completed. LateRooms.com cashback will track soon after booking, but will only be confirmed & paid after you have completed your stay. Book a room for the night, a weekend or a week or two and stay for less by taking up one of the LateRooms discount code and cashback deals we have on offer. If you have already organised your flights and just need somewhere to stay, you will find hundreds of thousands of late booking hotels which you can make savings on in locations worldwide, whether you are staying in the UK, Europe or a little further afield. Take your pick from cosy B&Bs, English country houses, luxury spas or Thai beach huts and, whether you choose a leading brand hotel or independent guest house, book online 24/7 and pay when you stay. When making hotel bookings, you can check availability for cheap hotels close to the top attractions in the place you are thinking of travelling to or which are inclusive of breakfast. 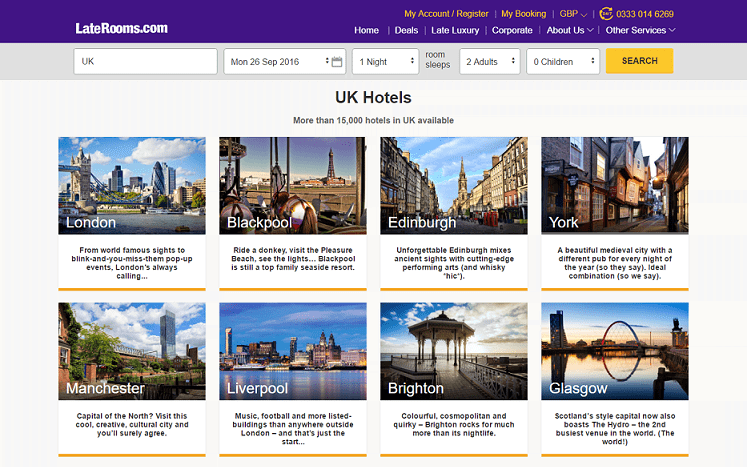 If you are planning city breaks for a couple of nights or a family holiday, you will find more than two million genuine guest reviews, which you can use to help you make your decision, while there are no booking or cancellation fees - as long as you cancel within the terms of the hotel's cancellation policy. As well as accommodation, you can also book low-cost worldwide car hire with their partners, which include Europcar, Sixt, Alamo and Hertz. They offer a price promise, while members can save up to 70% on luxury hotels and holidays with Late Luxury. Wherever you are looking to travel to, LateRooms.com offer more than 200,000 hotels dotted all over the globe which are ideal for family holidays, weekend breaks for adults or business trips. With more UK hotels than anyone else, you can book a room for a break in top destinations such as London, Birmingham, Dublin, Edinburgh and Liverpool, while they have many hotels in European locations in Italy, Spain, France, Greece and Portugal, which you can book as late as the day of your stay or as far as a year in advance. If you are travelling a little further afield, you can find resort and hotel deals for popular summer or winter international destinations like New York, Dubai and Hong Kong. Stay in a Comfort Inn, Best Western, Ramada or Radisson Blu hotel and save money with our LateRooms.com voucher code deals when you become a member of TopCashback by filling out the form at the bottom of this page. LateRooms.com was established in Salford, Greater Manchester, in 1999. It began life as an 'on the day for the day' booking site selling unsold hotel rooms. While they are still based in Manchester to this day, the site now offers more than 200,000 properties across the globe, while they also boast more UK hotels than anybody else. You can still book late hotel deals on the day of your stay, but they also allow you to secure a room up to a year in advance - ideal if you are planning a special holiday, celebrating a birthday or anniversary or planning on visiting family abroad. As well as being able to save on hotels worldwide with our LateRooms.com discount codes when you book online, you can be sure of getting a great deal thanks to their Price Promise. This means that if you should find the same hotel room at a cheaper price elsewhere online, they will refund you the difference. If you have a booking with LateRooms.com, you can make a Price Promise claim as long as the lower rate you found is available for booking the exact same room online, including the same room type, hotel, check-in and check-out dates and booking conditions, such as whether it includes parking, breakfast or dinner. The lower rate must be in the same currency and must not include membership rates or frequent stay, loyalty or reward points. The lower rate must not be from a website which only reveals the hotel after you have booked, while you must make a claim within 24 hours of completing your LateRooms.com booking, as long as it is not for the same day or next day arrival, by completing a claim form - a link to which you will find in their help section. Their Late Luxury range of accommodation offers stylish escapes for travellers at members-only rates. Join now for free using your email address and they will give you access to the best rates, guaranteed, for hand-picked hotels in the UK and abroad which will allow you to make savings of up to 70% on luxury accommodation and holiday bookings. You might be surprised, but even the best hotels in the world have empty rooms they want to fill, and LateRooms.com negotiate the best rates you will find anywhere online. Their exclusive hotel offers are only available to members, so sign up today on the LateRooms.com website and start taking advantage today. Rest your head for the night in a great location and make great cashback and discount code savings on more than 150,000 hotels worldwide with these offers. LateRooms.com is the UK's leading hotel booking specialist, providing a whole host of hotel possibilities. You will find more UK hotels than anywhere else, as well as a huge range in Europe and worldwide - from cosy B&Bs to luxury spas, Thai beach huts to English country houses. Book 24/7, pay when you stay and earn a fantastic discount with our offers. Book a room in top UK destinations such as London, Dublin or Liverpool, as well as further afield places like Paris, Venice and Amsterdam, and stay in a Hilton, Jurys Inn, Radisson Blu or other leading brand hotel for a city break or a family holiday.